Folk Fest – August 20, 21, 22! Howard Finster is one of the prominent folk artists who have been represented at Folk Fest over the past 17 years. The origins of Folk Fest at Norcross’ North Atlanta Trade Center can be found in Cleveland, Ga. Folk Fest originator Steve Slotin taught summer camp as a high school and college student in this North Georgia village. One day he stepped into Smith’s Soda Shop for lunch and entered into another world. Lining the shelves were face jugs made by Cleveland resident Lanier Meaders. Slotin fell in love with them, and the art world hasn’t been the same since. Folk Fest 2010 is an important event in the world of folk art, the world’s largest show of its kind. Held on Aug. 20, 21 and 22 at the North Atlanta Trade Center in Norcross, the event features 100 galleries, 85,000 square feet of folk art and the opportunity for collectors to meet hundreds of artists. The North Atlanta Trade Center is at 1700 Jeurgens Court in Norcross, close to Interstate 85 at the Indian Trail-Lilburn Road exit. Folk Fest 2010 is open to the public from 5 to 10 p.m. Aug. 20 for a $15 ticket, which includes a meet-the-artists party and show opening. Hours on Aug. 21 are 10 a.m. to 8 p.m. and hours for Aug. 22 are 10 a.m. to 5 p.m. Both Saturday and Sunday tickets are only $7 and children 16 and younger will be admitted free of charge. According to Slotin, there is something for every level of collector. Folk Fest has seen many very valuable works of art trade hands. A Howard Finster painting sold for $15,000. A Mattie Lou O’Kelley memory painting sold for $26,000. A New York gallery owner paid $10,000 for an “Anonymous Whirligig.” A rare face jug created by Lanier Meaders’ father Cheever sold for $12,000. Drawings found on cardboard by freed slave Bill Traylor went for $55,000 to $60,000 each. The atmosphere is a bit more laid back than traditional antique sales, according to Slotin. 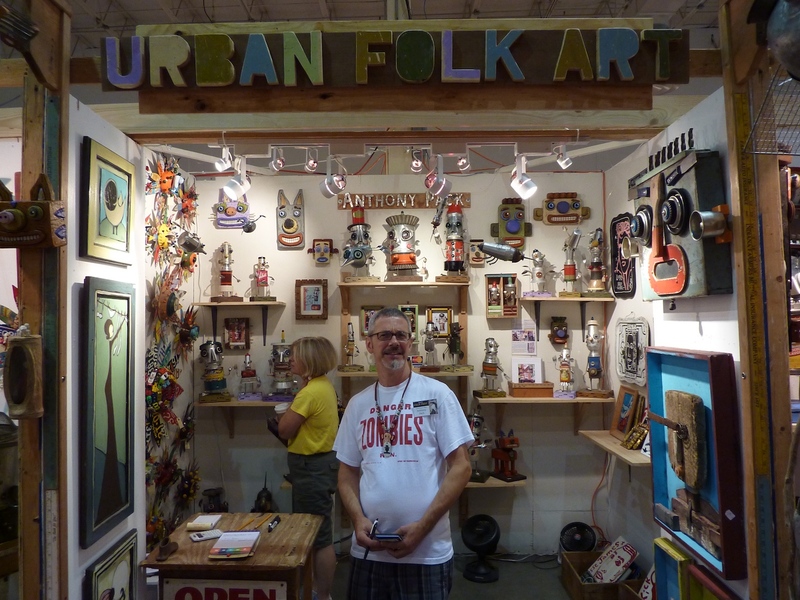 “We eat, we drink, we laugh and the audience really learns a lot about folk art and the value of the piece,” he said. Folk art is not to be considered “crafty.” It is described as self-taught art and is also referred to as outsider art. It is highly personal art. It is religiously inspired paintings, crude tin cut-outs, wood-relief carvings and environmental sculpture gardens created from refuse and other found objects. Its existence is being threatened by the onslaught of urbanization and the spread of the ’burbs into once rural areas. “This art is created by untrained people with little or no access to training, who draw on their culture and experiences in an isolated world, and made with a true, untutored, creative passion,” Slotin said. “It’s raw, expressive, unconventional, nonconforming, genuine and truly original. “Folk Fest serves to celebrate these artists, bring their works of art together and share with the public the experience of a culture whose roots may soon disappear,” he added. For more information on this year’s Folk Fest, call 770-532-1115 or visit www.slotinfolkart.com.